In Dec. 1942 Heinrich Mueller, Chief of the Gestapo, rolled up the Soviet spy network in mainland Europe and secured a list of Soviet agents and informants in England that reads like a "who's who" of the British establishment and lifts the veil from modern history. 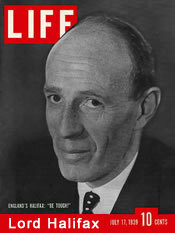 Spies include Edward Wood, Lord Halifax, Neville Chamberlain's Foreign Secretary and an architect of the "Appeasement" policy. Appeasement encouraged Hitler to think England wanted him to expand eastward against the USSR. In fact, Halifax was working indirectly for the Communists. Appeasement was designed to trap Hitler in a two-front war which would level Germany (and Europe) and kill sixty million people. Mueller's list of spies includes Victor Rothschild, the head of the central banking dynasty, long suspected as one of the "Cambridge Five." Curiously, the other four (Burgess, Maclean, Blunt and Philby) aren't on this list. It includes Charles Hambro, another banker of Jewish origin who was part of a Bank of England decision to continue financing Nazism in 1934 as a "stabilising influence." Obviously, as a Soviet asset, this man was not pro-Nazi. It includes Sir Robert Waley-Cohen and many members of the anti-appeasement "Focus" group that funded Winston Churchill. Waley-Cohen was the Chairman of the Rothschild-controlled Shell Oil and the leader of the British Jewish Community. Other bankers, banking scions and industrialists include Eugen Spier, Maurice Baring, Leonard Montefiore, Edward Guggenheim, Sir Robert Mond and Sir Phillip Sassoon. All but Baring are of Jewish origin. Prominent Labor Party and trade union leaders included Ernest Bevin, Harold Laski, Herbert Stanley Morrison and Sir Walter Citrine. Members of ancient aristocratic families include Richard Combe Abdy, Baron Strabogli, and Admiral Reginald Plunkett-Ernle-Erle-Drax. There was press mogul J.S. Elias, cartoonist Victor Weisz and Daily Express Chairman Ralph D. Blumenfeld. What did this disparate group have in common? About half of them are recognizably Jewish. But the connection that binds them all likely is the Illuminati, the top rung of Freemasonry. Its aim is to weaken mankind through a series of contrived unnecessary wars in order to establish a Masonic or "Illuminist" world dictatorship dedicated to the "light giver" Lucifer (their alter ego.) Bush, Clinton, Kerry etc. are all members. The Illuminati started Communism. Their common anniversary is May 1; their common symbol is the satanic inverted pentagram. They funded the Bolshevik Revolution and secretly ran the USSR, which was a model for the New World Order. Far from being spies for Stalin, some of these men were probably his superiors. Soviet Russia was a dummy creation of the London-based Illuminati. The Second World War, the Cold War, and now the "War on Terror" are all their inventions. They are responsible for the neo-pagan assault on Western Civilization, Christianity and Islam (incl. family, nation, race, morality and truth) that we call modernism, humanism and globalism. The list is in the secret papers of Heinrich Mueller who died in California in 1983. The CIA recruited Mueller in Switzerland in 1948 and paid him $1 million for an Interrogation running 1000-pages. Mueller left his microfilmed archives to his nephew, "Douglas Gregory" who has published a large part. The Bank of England funded the rise of Adolph Hitler through the Schroder Bank. F.C. Tiarcks, the Managing Director of the Schroder Bank, was also a Director of the Bank of England. While history portrays Hitler duping the naive Neville Chamberlain and Lord Halifax, it appears Hitler himself was tricked into thinking he could expand eastward with impunity. Neville Chamberlain wasn't in on the secret. (He died prematurely just months after leaving office.) But as a Soviet informant, Halifax certainly was instrumental. As an early opponent of British rearmament, Halifax encouraged Hitler's plans and complimented him for being a "genuine hater of Communism." In a meeting with Hitler in 1937, Halifax actually offered to make changes in the "European Order" in regard to Danzig, Austria and Czechoslovakia. Appeasement was designed to encourage Hitler to take action which would justify a declaration of war by the West. Halifax was responsible for the foolhardy British guarantee of Poland that led to this declaration. Stalin was pre-primed to attack the Nazis in 1941. The whole knuckle-biting drama of war and peace was a charade. Wars are the artificial creation of the Illuminati, a satanic cult that is extending its tentacles over the whole planet. "Muller's List" provides a glimpse at the composition of this group: bankers, industrialists, aristocrats, military, scholars, trade unionists and media. There are a lot of Jews but it should be obvious that the Illuminati victimized Jews as much as anyone. Jews have been the canon fodder for Communism, Zionism and Nazism. Instead of defending the Illuminati, Jews should revile it. Otherwise they appear to be in collusion. Possibly some listees didn't realize what they were advancing. The Illuminati pretended to be opposed to fascism. Today they pretend to build a humanist utopia, an answer to poverty, disease, prejudice and injustice. Former World Bank President James Wolfensohn had the slogan "Plutocrat for the Poor" on his web site. The Illuminati starts wars to demoralize and destroy humanity, to consolidate power and produce huge profits and debt slavery. This cult, which has a stranglehold on thought and expression, pretty much defines realty. Our best course is to find our truth from different sources and define reality anew. and articles on Winston Churchill and Lester Pearson.